...We'd Love To Hear It! What really says, "You're in Central Asia!"? Share photos that capture your top "Magic Moments"? Share the craziest wedding you've been to! Shopping - what are your favorite bazaars? What's your favorite local dish? 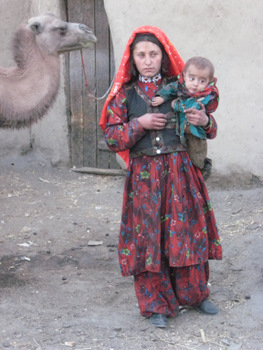 Or if you have a general story about your travels that does not fit into any of the above, use this page to share it with others who are interested in Afghan culture, too. Do you have a cool story to tell about your experience in Afghanistan? Do YOU have a great story to tell about your time in Afghanistan? It will be enjoyed by people from all over the world...for years to come!. Thanks in advance for sharing it with all of us. A fascinating story of one man's repeated attempts over a 30-year period to visit the most inaccessible World Heritage sites of the world...in Afghanistan. Karen, a third-culture-kid(TCK), now an adult, explains why she misses "home." One woman's experiences helped her learn small customs which help her blend in. A common experience for many. The story of Maryam, an Afghan girl forced to marry to pay for her father's crime. Hiking in the Wakhan when you're 60? John and Lisa's crazy trip hiking the Wakhan Corridor as tourists last Fall. One NGO story of success doing development work in Afghanistan. A story of how several International NGO's made a difference in one girl's life. A story of several families picnicking near the Oxyx River. A story of one Afghan family's most recent tragedy.